The first General Epistle of the Twelve under the presidency of Joseph Smith III, son of the Martyr, was addressed: “To all the Saints scattered abroad.” To this Epistle an appendix was added by President Smith. The appendix was in the nature of a revelation from God and was so accepted by the church at the semiannual conference of 1871. 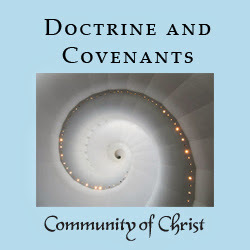 Its inclusion in the Doctrine and Covenants was authorized by the semiannual conference of 1878. This is the first revelation given to the church thorugh President Joseph Smih the III. It was dated October 7, 1861. The Epistle and appendix were published October 25, 1861. 1b. and let them before God see to it, that the temporal means so obtained is truly used for the purposes of the church, and not as a weapon of power in the hands of one man for the oppression of others, or for the purposes of self-aggrandizement by anyone, be he whomsoever he may be. 2. As I live, saith the Lord, in the manner ye execute this matter, so shall ye be judged in the day of judgment. Copyright © Community of Christ Copyright Corporation. Used with permission. Picture Window theme. Powered by Blogger.